NC Swamp Buster Duck calls are a line of custom, handcrafted duck calls which encompass a slightly larger barrel profile than my typical call styles. ‘Not overdone’. This increase in mass produces absorbs some of the sound wave, rendering a softer, more subtle quack. They are a timber style call and excel in hardwood swamps, backwood’s waters, creeks, small lakes, impoundments and rivers. The subtlety reduces acoustical reverb from bouncing off nearby tree lines. I understand all too well the facets associated with hunting swamps and impoundments– battling briars and cat-claws, hidden stumpholes and surprise dunks. Thus the NC Swamp Buster series possess a deeper, more prominent lanyard groove to ensure your call stays where its supposed to- ‘on your lanyard’. 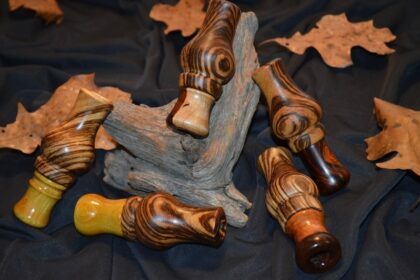 As with all of my custom calls, this line is no different in its finishing process. They are finished with 3-4 applications of a proprietary finish. Depending on wood species some receive an additional topical application of exterior grade polyurethane. The NC Swamp Buster duck calls were designed and meant to be hunted with–“no worries, just hunt”. Mellow, softer, low-end duck talk. Good for working ducks in tight quarters and for close-in calling. NC (North Carolina) because ‘that’s where we’re born’ but we’re not anchored here. These calls hang on lanyards in the Atlantic, Mississippi, Central and Pacific flyways.